DALLAS, TX -- (MARKET WIRE) -- April 23, 2007 -- Construction is complete on a 37,000-square foot, $1.6 million off-shoring facility in Chennai, India, which will house up to 500 employees, officials at Dallas-based GDES announced today. The new building is home to GDES' flagship offering, Global Workforce Solutions™, which provides companies direct access to a low cost, highly educated workforce in India providing up to a 60 percent savings in operational costs, a rarity in an industry that has historically shied away from providing quantifiable savings. Construction of the Class A facility, located in India's fourth largest city and home to major multi-national companies like Ford, BMW, Hyundai, World Bank, Standard Chartered Bank, Ericsson, Motorola, and Nokia, was overseen by India-based contractor ETL Infrastructure Services. The facility includes employee-friendly features not commonly seen by most traditional offshore facilities. In-house cafeteria, restaurants, retail outlets, medical facilities, fitness and recreational facilities, large lawns, open outdoor sitting areas and natural trees lining the facility are some of the aesthetics to be enjoyed by GDES employees. "We are very pleased to open our Chennai facility as a satellite office for North American companies who are looking to establish a global workforce to take advantage of low cost labor without worrying about many of the negative attributes associated with traditional outsourcing," said GDES CEO Steve Clemons. "Because we provide our customers complete transparency into our cost structure, complete flexibility to change their processes without having to negotiate the contract, and complete control over their work content, we are able to directly deliver significant savings to our customers." GDES' Global Workforce Solutions offers an alternative to traditional outsourcing by providing companies with a facility to process work such as document scanning, data entry, x-ray analysis, or any process that can be done anywhere in the world as long as someone has a computer and internet connection, are conducted by specially trained employees that report directly to an onsite company representative. By accessing GDES' infrastructure, companies save the time and resources that would otherwise be spent in a foreign country working legal, tax, real estate, HR and cultural issues to establish their own facility. In addition to housing the necessary equipment, computers, and services, the GDES Chennai facility is a full service office complex with a planned hotel on campus and 24 hour-a-day office access. Complete with scalable options, the facility's floor space is designed with North American companies' expectations for quality and scale. Over the past decade, Chennai has grown into one of India's major off-shoring marketplaces due to its highly educated workforce, cost of labor and generous tax structure. The cost of skilled labor in Chennai is approximately 15-20 percent lower compared to Bangalore, Delhi and Mumbai. GDES' facility is also located in a Special Economic Zone (SEZs). SEZs are exempt from state and central government taxes and import duties on equipment and technology in order to attract investment. These cost savings are ultimately passed on to GDES customers. 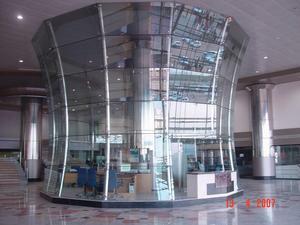 The facility is located 30 minutes away from the Chennai International Airport. Chennai is also home to South India's only US consulate. "Because our offering calls for a team leader of North American companies to be located in Chennai, it was important for us to build out a facility that included many of the features the American workforce has come accustomed to, and go beyond that by providing access to a quality American international school, the US consulate, and other amenities that will ensure a smooth transition period." Through its parent company, Aster, GDES offers Global Workforce Solutions to North American companies looking to achieve the benefits of executing business processes in India and other global low cost locations without giving up direct control over quality, productivity or long-term cost predictability. GDES is located at 12225 Greenville Avenue in North Dallas just south of I-635, For more information about GDES, visit www.gdes.org.